It turns out I go a bit crazy in the kitchen when I’m anxious. In the last 2 weeks I’ve made cupcakes, apple cake, mont blanc, 3 batches of cookies and 2 batches of caramel popcorn. I guess cooking is a nice way to relax and it’s something you have control over when life sometimes feel a bit out of your control. The cause of my anxiety has undoubtedly been the move, but also the boys started at their new school today…always a bit nerve wracking. It went well (sigh of relief). So to celebrate and torment you, I shall share my wisdom on caramel popcorn. I don’t even know why I had to make it, but I just did. I have looked around recipes and I have made some mistakes. Here’s what I’ve learnt. – it’s really hard to get a good coating, so I’ll give you ratios for greedy guts’ like me who like a well coated kernel. – I’m not too sure what makes it stay glossy….I’ll have to let you know when I figure that one out. Have the pop corn spread out, in one layer in a baking tray. In a medium sized pot, melt all the ingredients together except the bi-carb soda. Ok to stir at first, but once it’s combined, stop stirring. Bring to a boil and bubble on a medium-low heat for about 4 minutes. Swirl the pot to keep it mixing. Take off heat and stir in the bi-carb soda. Stir until it goes creamy looking, about a 30 seconds. 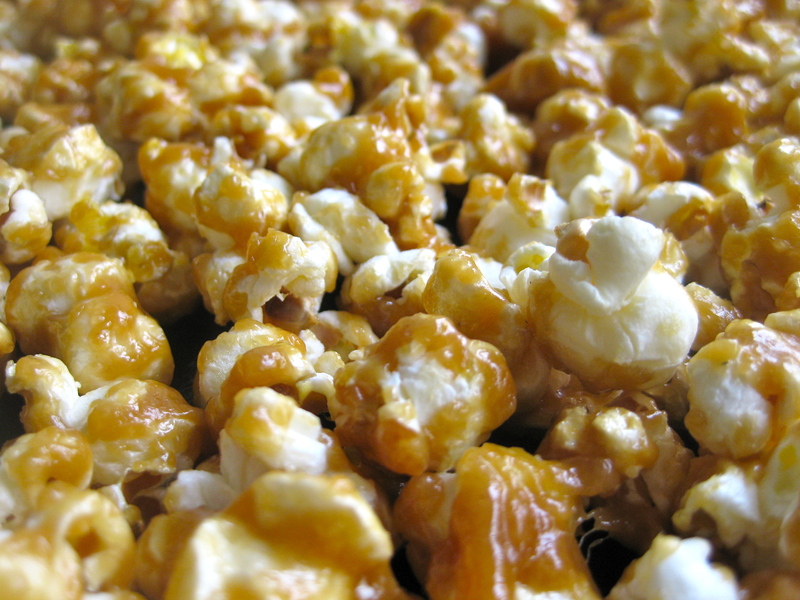 Pour the caramel over the popcorn and mix it all around to coat it as well as possible. This bit’s tricky, it all goes flying, so do your best. Use a couple of wooden spoons at first, because it’s a bit hot. The caramel cools quickly though, so you have to work fast and eventually you can use your hands to mix even more. Pop it in the oven for a few minutes at a time. Stir and pop back in. I wouldn’t give it any more than about ten minutes in the oven, or it will go too crunchy and might dry it out too much.